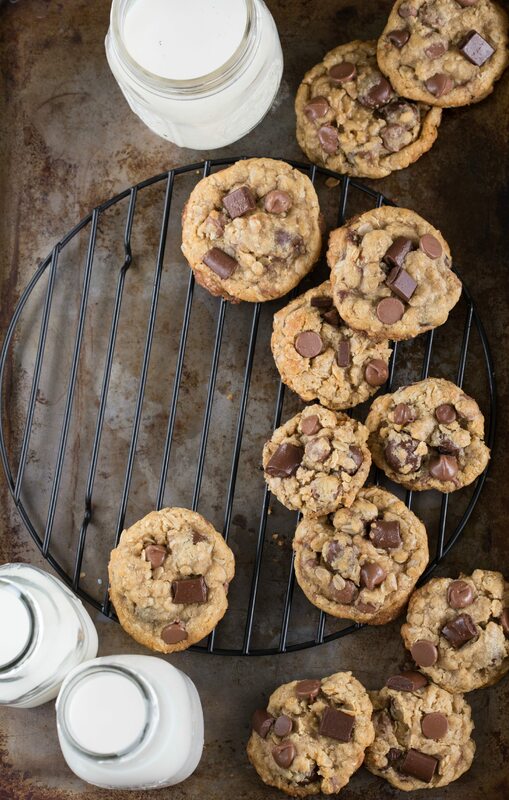 Healthier oatmeal chocolate chips cookies with a few healthy swaps – oat flour and coconut oil. These cookies have delicious dark chocolate cranberries mixed in as well making for a better for you dessert. Chop the chocolate covered cranberries in half (and in half again for large ones). Measure to get 1/2 cup. Beat together the coconut oil, brown sugar, and white sugar until well combined. Beat in the full egg until combined and then beat in the egg yolk and vanilla. I added the gram amounts for the flours so you can measure them if you have a scale - everyone measures flour differently, so I highly recommend measuring the flour for optimal results. Stir together the white flour, oat flour, baking soda, salt, and cornstarch. Slowly beat into the wet ingredients. Stir in the oats, chopped chocolate-covered cranberries, and chocolate chips. Pack the dough into a cookie scoop and onto a baking tray. Insert the chocolate chunks in the top of cookies (this makes them prettier, but you can stir in the chunks to the dough if desired). Cover the cookie sheet with plastic wrap and place in the fridge for at least one hour and up to 24 hours. Remove and bake at 350 degrees F for 8-10 minutes. The key to soft cookies with a crispy edge is to slightly under-bake the cookies. As soon as they turn brown around the edges, pull them out and let them continue to bake on the tray. Healthier and cookies? Where do I sign up! These sound delish girl…pinned! These cookies look amazing, Chelsea! I love the chocolate chunks of cranberries in here. 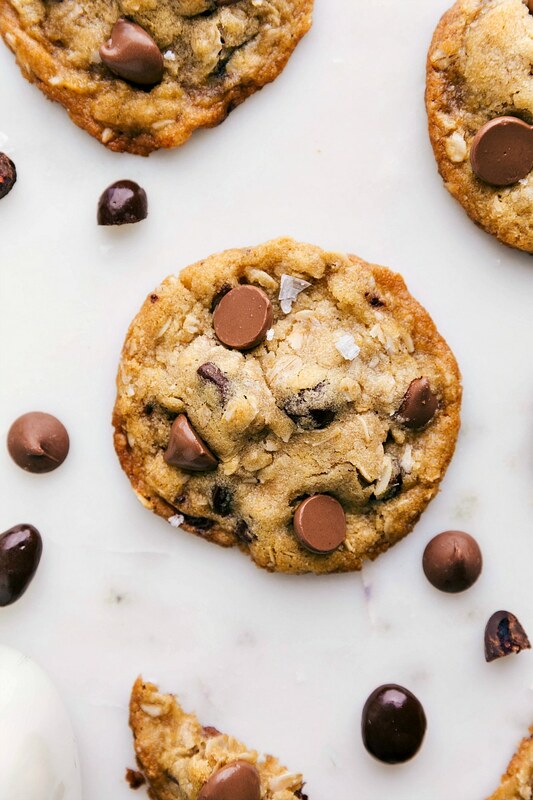 And a healthier cookie is right up my alley. Pinned! These cookies look so good! I love dried fruit and chocolate together, it’s the best! Oh my word, these sound outrageously good! Lol aren’t husbands funny? Love these lightened up gems! Chocolate covered cranberries—-I will get on that train. I have been cookies with dried cranberries and chocolate chips before, but I am taken with this much more. I am on the hunt for that product. LOVE the new blog design Chelsea! And these cookies look amazing! I never would have thought of putting chocolate covered fruit in a cookie, but it sounds amazing! These are so yummy looking. I love that you used chocolate covered cranberries. Sharing this post! I just saw these over on another one of my friend’s blogs and I seriously need to run out and find them immediately. I adore chocolate covered fruit and I can only imagine how wonderfully they go inside these oatmeal cookies! They look amazing, Chelsea! Haha I’m glad you and husband cleared up the whole chocolate debate. From the very beginning of our marriage, I told my husband to never get me flowers. Chocolate is the key to my heart. Don’t get me wrong. I do like getting flowers from time to time..but I’d rather he spend the money on a decadent BOX of chocolate. These cookies look so so good! I love that you healthified them too ;). Pinning and making very.very soon! Thank goodness you cleared up that misunderstanding early on! These cookies look divine! 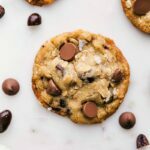 Soft and chewy like an oatmeal raisin cookie should be! I love that you put chocolate covered cranberries in there! So smart! These cookies sound fab!! 🙂 I’m loving the chocolate covered cranberries in them, yum! I wouldn’t miss the opportunity to try to make these cookies because they are the most delicious! Made these today…. The WHOLE family loved them!!! YAY!! So glad to hear it 🙂 Thanks for the comment Kiki! I made this recipe it is so good thanks. Can i use butter or vegetable oil instead of coconut oil because it is too expensive in my area ??? Thank you! I haven’t actually tried either so I can’t say for sure, but I believe butter would work fine here. Hope that helps! rolled oats? I’m trying to get away white flour. Made these yesterday and I must say that the whole family loved them. Will definitely make them again. By the way, I used butter instead of coconut oil because that’s all I have. Thanks for a great recipe! Just made these…our new go to recipe!! Absolutely perfect, I used butter in place of coconut oil, and all chocolate was chocolate chips, but still an excellent cookie. Thanks for a perfect cookie recipe!